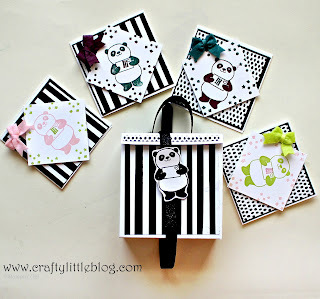 How cute is this Panda stamp set? Just love it and love it even more because it was free. This week I'm going to be posting a ton of video tutorials and blog posts showing different easy make projects using some of the items from the new Stampin' Up! Spring Summer 2018 catalogue and also from the Saleabration catalogue. Today is the turn of these Panda notelets and gift bag which I love. They are mostly monochrome but each one has a pop of colour thanks to the 2017-19 in colours. I used Lemon Lime twist, Fresh Fig, Tranquil Tide and Powder Pink on these cards. I started off with a whisper white cardstock base measuring 6 x 3 and folded in half making a 3 x 3 card front. To this I added black cardstock just a sixteenth of an inch smaller on each side. On top of this I added the black and white monochrome stripes or dots from the Tutti Fruitti DSP which is bursting with fruity colour but I opted to use the less colourful papers as they were just perfect for my project. These were again a sixteenth of an inch smaller than the black layer and so far I had glued everything using Tombow liquid adhesive. On top of this layer I added a 2.5 square of whisper white which was set to the diamond position using dimensionals. 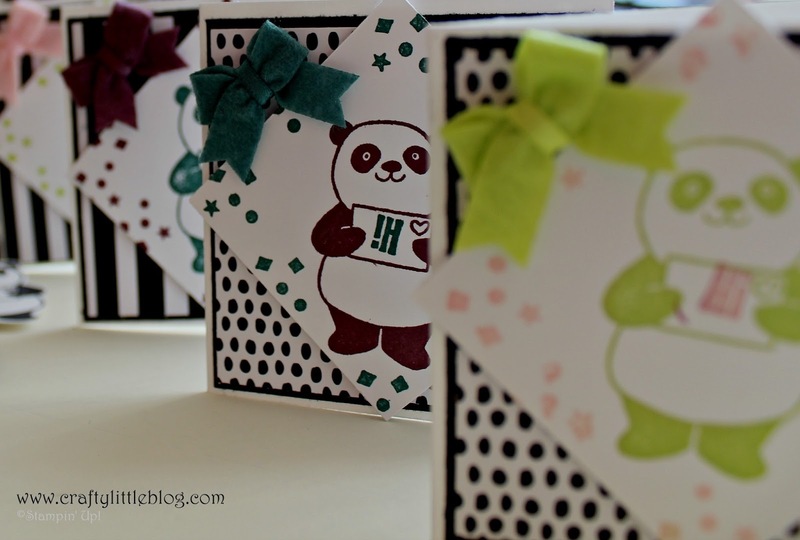 These were printed with a panda holding a little envelope onto which I stamped Hi using the stamp from the panda set. 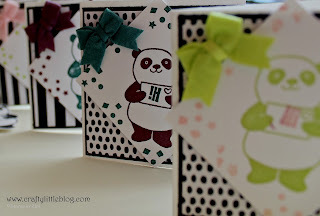 I stamped pandas in each of the four colours named above and then added the little confetti type stamp in a contrasting colour and finished each card off with one of the bows which come pre-made as embellishments. I love that I even messed up and got a quirky upside down 'Hi' on one of the cards. 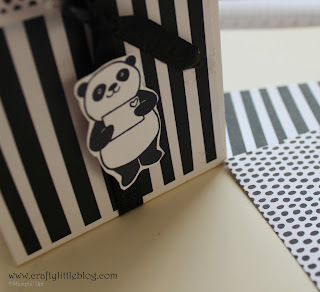 The gift bag started life as a piece of whisper white cardstock measuring 10 x 5.5 inches and had panels of DSP glued onto it as well as black handle. I added a fussy cut panda printed in black onto whisper white and attached to black shimmery ribbon with dimensionals. The video tutorial for the bag is on my You Tube channel. Unfortunately I either lost or I failed to press record when I made the tutorial but fortunately I had recorded the making of the prototype so I was able to edit and share that, so click here if you want to pop over and take a look at that. I do intent to repeat this set of notelets in a brighter colour later in the week so watch out for that if the video available isn't quite good enough. Enjoy crafting in 2018, it's going to be the year when my crafting game steps up for sure and I'm so happy that so many people join me here and on my other platforms to share my journey with me.